Fall is here, and this brings new problems to your home and yard as animals prepare for winter. Remember, all these pests are trying to do is survive, and it’s your job to make sure you don’t make your house look appealing. Like a house guest that never leaves, if you keep food, shelter and water readily available, you’ll have pests staying forever. Here are some of the more common pest problems in Ontario for the fall, and what you can do about them to avoid them. With so much fresh fruit and vegetables available in the fall, like Apples from Bennet’s or Carluke Orchards, or Tomatoes and Potoatoes from the Jerome Brothers, you’ll find you’ll get a lot of fruit flies in your home if you leave the fruit out on the kitchen counter to ripen. When the fruit is ripe, you might get fruit fly maggots in the fruit, and an infestation can get out of control rather quick. There are several ways to reduce fruit fly infestations. 1. Clean infested areas with soap and water. Get out that tooth brush and scrub those hard to reach areas to eliminate grubs. 2. Don’t keep fruit scraps in an open container. Instead bring them to the compost, or tie them up in a plastic bag. 3. Tidy up and return any empty beer, wine or liquor bottles to the LCBO. 4. Keep fruit in the fridge to ripen, or if you must keep it out of the fridge, put it in a bowl with a plate on top. Eat your fruit before it gets overly ripe. 5. Fruit flies will thrive in empty pop and juice cans and bottles, which is why it’s a good idea to wash these before putting them in the recycling bin. Store the recycling bin out of the kitchen, like in the basement, backyard, or garage. 6. Home Hardware or any hardware store/department sell fruit fly traps that you can employ, or you can do a Google search for homemade fruit fly traps. If all your efforts with fruit flies are a losing battle, contact us at Anypest where we can use our methods to eliminate fruit flies for once and all. Fall is such a tough time for Raccoons and Skunks. The roads around where I live are normally littered with these poor critters who have been struck by cars. Raccoons and skunks are quite active in the Fall as they are fattening up with the upcoming winter. Since they are nocturnal, and the sun sets earlier in the fall (like 7:30 by October), they are active as lots of people are still driving out at this time. 1. Skunks and raccoons are going to visit your house frequently if you leave your dog bowl outside. If you keep fresh water and food nearby, why wouldn’t they want to visit you. 2. People keep their garbage outside at night, which will attract these critters, so bring your trash indoors. 3. 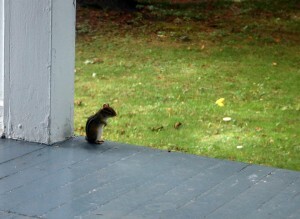 Animals also want shelter, and underneath your porch or deck is the perfect spot. Put up barriers so skunks and raccoons can’t access these cozy spots. 4. Skunks aren’t great climbers, but Raccoons sure are. Make sure there are no holes in your roof, or near your attic, or else you’ll have a new tenant for the winter, who is a lot messier then a teenager. Most of these are steps so you don’t attract Raccoons and Skunks in the first place. Once you have them, they are difficult to get rid of. That’s when it’s best to call us. While rabies is rare in skunks and Raccoons, Dystemper isn’t, and it can easily be transferred to your cat or dog. The time and effort you spend to properly get rid of Skunks and Raccoons is often far greater than what we charge, and we guarantee our results. We are humane with our pest removal techniques (we love animals after all) and we abide by all municipal and provincial laws. Similar to the Raccoon and Skunk, squirrels often have their lifespan shortened when the fall strikes, due to being struck by a vehicle. By the time October hits, you’ll see dozens of dead squirrels on the road on your daily commute to work. This is because they are getting ready for the winter. While Squirrels don’t hibernate, they do collect food and boy, do they ever love to hide it about your property. 1. If you have any trees that produce nuts (such as walnuts) or pine cones, keep an eye on what squirrels are doing with them. See that little red squirrel above? This guy hid 16 pine cones in my car when I left it parked in my driveway over the weekend. 2. Inspect your eaves and roof for holes. If you have a weak spot, get it re-enforced. Once squirrels get into your attic, the mess you’ll have to clean up is tenfold of that of if you just took the time to make sure they couldn’t get in, in the first place. 3. Ditch the bird feeder. While squirrel proof feeders exist, birds are always going to knock seed to the ground, which attracts squirrels. Squirrels are curious, and while they are near your house, they’ll investigate every nook and cranny to see if they can get to a warm place to camp out. With squirrels, prevention is key. Keep an eye on your home, fix any weak spots and don’t give them any reason to want to stick around your home. When I was a college student I lived with a roommate who was a slob. He would leave bags of chips about and pizza crusts strewn around his room. This habit was fine in the summer, but once it got cool outside, the mice just flocked into our residence. Mice instinctively want to come indoors when it gets cold out for the heat. Providing them with food, just gives them more incentive to stick around. To keep mice out, you have to find how they are getting in, and not keeping food easily accessible. 1. Inspect your house foundation. If you find small holes the size of a dime, patch them up. Check around water pipes as well, where there are often gaps. You can stick steel wool in these holes, which mice can’t chew through. 2. Don’t keep food out. If you have mice, buy plastic containers to store your cereal, rice, flour, and sugar in. These also keep ants out. Mice love chips. I’ll never forget the expression on my lazy college roommate’s face when he got to the bottom of a partial bag of nacho chips, and found the bottom was full of mice turds. 3. Don’t keep piles of wood against your home. Mice like spots to hide, and woodpiles are perfect for them. Once they are hidden in the woodpile, it’s only a matter of time before they decide to tunnel through your wall. Keep shrubs and tree branches away from the home too for the same reason. 4. Keep the compost pile far away from the home, and keep it to vegetable and fruit matter. Don’t toss things like rice, bread or pasta into the compost either these will attract mice along with other pests. 5. Mice are typically quiet, and if you have one or two, you typically won’t see them as they’ll stick to the attic or inside the walls. It’s once you begin to see mice wandering about in the open that you’ll know you have an infestation. This is because all your quiet places in your house are overpopulated, so the mice have nowhere else to go but your kitchen cabinets, basement, or bedroom. To paraphrase a famous Albert Einstein quote, he once said something along the lines of: Insanity is doing the same thing over and over and expecting different results. Yet so many people spend decades just putting out mice traps, not realizing that they aren’t solving the problem. To eliminate mice from your home, guaranteed, call Anypest today. You’ll sleep better, and be less stressed knowing your house is free of pests. This entry was posted in Blog on 2014/10/14 by Any Pest.